Looking for great-tasting baked strawberry desserts? Come here for a strawberry shortcake recipe, strawberry cobbler recipes, a bread recipe and more! Fresh-baked strawberry goodness! Strawberry shortcake might be the world's most popular baked strawberry desert, but baked strawberry pies are simply not to be missed, either! Strawberry pizza pie is really popular on pizza night--if you bake your own pizza for dinner, why not bake your own strawberry pizza for dessert? Speaking of dinner, a little strawberry bread or some strawberry muffins could add a special touch to any meal. And strawberry tarts, strawberry cookies, strawberry coffee cake... they all make a nice snack! Don't be shy: give them all a try! Warm strawberry treats! Fresh, homemade, baked desserts will really make someone's day! 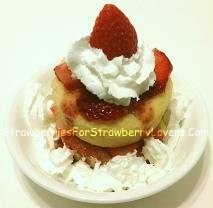 So if you're craving baked strawberry flavor, you'll find the recipe you need right here at StrawberriesForStrawberryLovers.Com, Home of the World's Happiest Fruit!